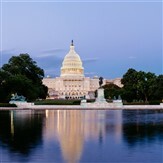 Join Martz for an exciting 4th of July Celebration in Washington DC !! The 4th of July is one of the most exciting times to be in Our Nation's Capital ! You will be able to see the Independence Day Parade and then, if you wish, the actual Declaration of Independence in the National Archives ! There is no better place to celebrate America's Birthday !! With fast food stop enroute, we expect to arrive in Washington DC at approximately 11:00 am. The Parade starts at 11:45 am. and ends at 2:00 pm. The parade route is on Constitution Ave, starting at 7th NW St., ending at 17th NW. We will drop off as close to the intersection of Constitution Ave and 17th St. NW as traffic and designated restrictions allow. The bus will not be available to passengers throughout the day. Following the parade, you will have free time for sightseeing and dinner (on your own) before we depart for home. We will leave Washington DC at 6:00 pm to head home, making a rest stop enroute.